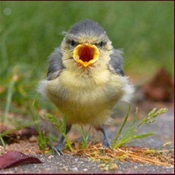 Feel like an angry bird..?? okay..but here are the do's and don'ts ..for your safety. Have you ever been followed? Whether you are on foot or in a vehicle, being stalked is no laughing matter. You can be stalked for a number of reasons, ranging from being picked as a mugging target to being an object of infatuation. There are some things you can do if you are stalked and there are certainly things you should not do. If you are stalked while you are driving a vehicle, make two left turns followed by two right turns or make four consecutive right turns. If you don't lose the tail, it likely is an actual tail. Drive in an unexpected pattern to confuse your stalkers and cause them to disengage. If you are on a highway and you feel you are being followed, take an exit to the nearest town, drive through and get back on the highway. Then do it again. Are you still followed? It's time to call the police. If someone has been following you for several days, change the regular pattern of behavior. For example top at a different place for coffee, skip your regular gym day or use a different dry cleaning place. Bottom line is if you are being observed, changing your patterns confuses your stalkers and they become unable to predict where you will be next. If you are walking, stay on light, clear streets with pedestrian traffic. Walk into a public place, and then into another one. Stay with the crowds; even in a public place, it's easy to harm someone. If you are still tailed, call 911. Do call 911 as soon as you have a reasonable suspicion that you are stalked. Give them detailed description of the individuals, the vehicle and the circumstances that prompted the call. If you feel threatened or scared, calling the police is your best option. No matter how curious you are and how much you want to find out who is following you and why, DO NO confront you stalker (or stalkers). That is probably the worst idea anyone ever had. We all have seen it in movies... A stalking scene followed by the traditional question, "Are you stalking me?" It never ends well and if nothing else, that should compel you to keep your mouth under control. Do not drive home unless you are out of gas and your house has National Guard stationed in it. Hopefully your stalker doesn't know where you live. It would be a shame if you were the one to show them. Do not panic. Fear has a way of rendering your mind useful. Not only that, stalkers can sense fear or they sense you are onto them. Do not walk into the subway or into side streets. Being followed can be scary, but again, there is a lot to be said about awareness. Try this exercise: Pick a place you see on the way to work. Each time you drive past it, note the changes that took place. New car in the parking lot? New landscaping? Do this for a week and move on to a different object. This exercise will train your brain to pick up the changes in your environment quickly. P.S. Learn these easy but devastating self-defense tricks and you'll have the ability to fight back, if the need ever arises. I can't stress how important it is to have these life-saving fight skills.